51 Pegasi b is the famous object Michel Mayor and Didier Queloz discovered in 1995 – an exoplanet around a star in the constellation Pegasus. The star was labelled 51 Pegasi by English astronomer John Flamsteed in 1712 in his star atlas. The lowercase letter “b” indicates that it was the first exoplanet discovered orbiting its host star. Other star catalogues used for naming exoplanets are for instance Wilhelm Gliese’s index (GJ) or HD named in honour of Henry Draper whose widow donated the money to finance it. 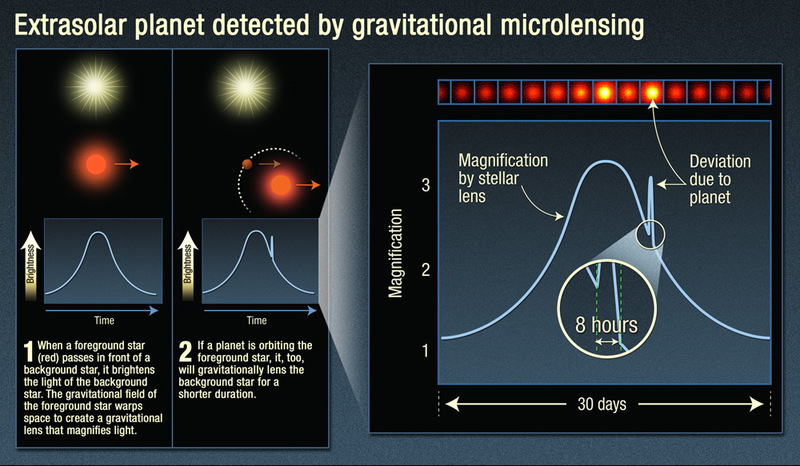 Exoplanets can also be named after astronomical projects like the ground-based Hungarian Automated Telescope Network (HAT) or their discovering space observatory. Kepler-34(AB)b is an exoplanet that was found by NASA’s Kepler space telescope. It orbits the object Kepler-34 consisting of two Stars A and B. 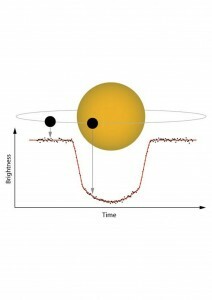 The exoplanet’s name shows that it circles around both of the stars in the binary system. Soon there will be nicer names for some selected exoplanets. 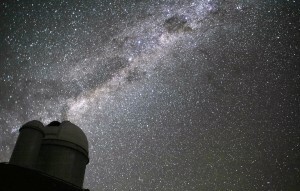 The International Astronomical Union started a contest to give popular names to exoplanets along with their host stars. Do we have photos of exoplanets? 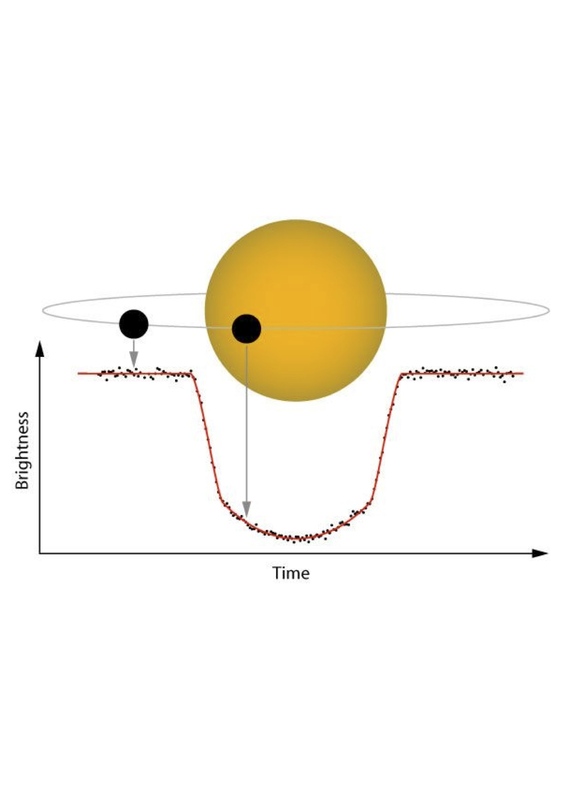 After the first exoplanet was discovered in 1995 by measuring the gravitational influence of the planet on its star by the radial velocity method, we had to wait 13 years to have the first true picture of an exoplanet. It was taken by the Hubble Space Telescope in 2008. 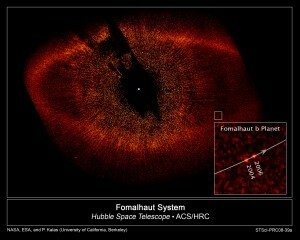 The object is called Fomalhaut b, a planet that is 4 times the Sun-Neptune distance from its star. 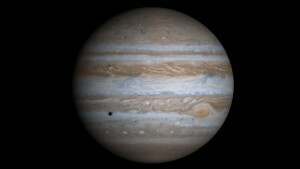 Its mass is estimated between 0.5 and 2 times that of Jupiter. Already in 2004 astronomers used ESO’s VLT to produce an image of a companion of a so called brown dwarf. To date, only about fifteen planets have been photographed. 1901 known exoplanets were listed in March 2015 by the Extrasolar Planets Encyclopaedia. The catalogue is regularly updated and steadily growing. There are over 3000 so called candidates that wait for confirmation. Planets seem to be very common objects in the universe – the rule rather than the exception. An average galaxy like our Milky Way contains about 100 billion stars. Analysing data of NASA’s Kepler space observatory astronomers have estimated that there are at least 100 billion planets just in our galaxy. Transits, when looking at the drop in brightness of a star when a planet passes in front of it. The intensity of the drop is proportional to the size of the planet. 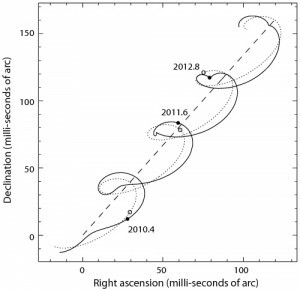 Radial velocities, when measuring the change in speed of a star caused by the presence of a planet. The value of the speed is proportional to the mass of the planet. Radial Velocity technique. Credit ESO. Gravitational Lens, when taking advantage of the passage of a planet in front of a very massive object which affects the light emitted by the planet. Astrometry, by observing the movement of a star, we can deduce the mass of the planet if the star shows an eliptical movment. 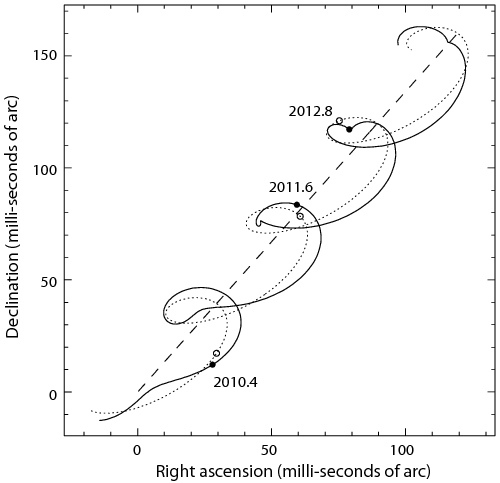 Path of a star viewed of a distance of 50pc and orbited by a 15Mj planet with a semi-major axis of 0.6 UA. 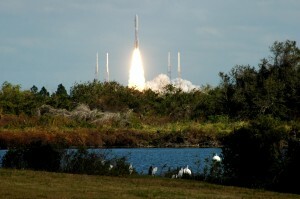 Credit ESA. 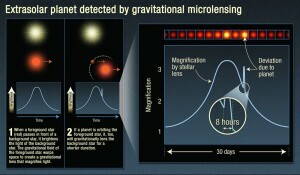 But thanks to advances in technology we start now to be able to detect some planets directly. These techniques are very difficult to implement and need the use of a cotonograph wich hide the star. It’s why only a dozen has been photographed until today. 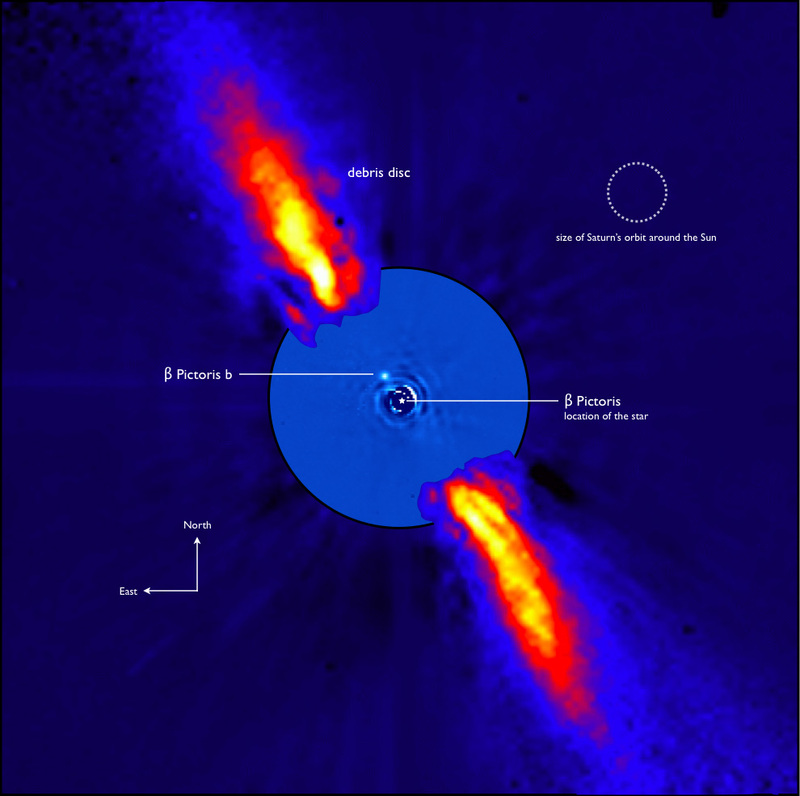 The Beta pictoris star is hidden by a coronograph, what allows to see its planet. Credit ESO. How are asteroids and comets named? The International Astronomical Union (IAU) is the formal authority for naming celestial bodies. Newly detected minor planets or asteroids get a provisional designation: For example 1989 SG1 was the 32nd object detected in the second half of September 1989. If the object’s orbit is confirmed it receives a permanent number and the discoverer is invited to suggest a name for it. 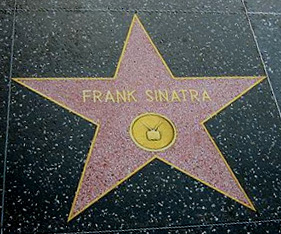 So 1989 SG1 became 7934 Sinatra named in memory of the American singer. This process can take decades. 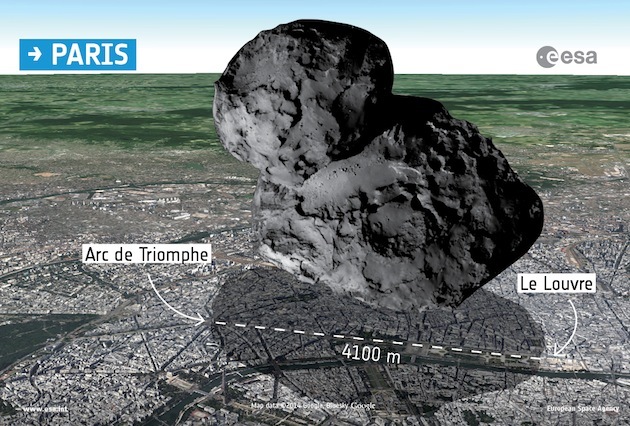 So if you want to make sure that your own name is on the sky you have to discover a comet. Comet 67P/Churyumov-Gerasimenko that was visited by the European spacecraft Rosetta had been named after the Soviet astronomers Klim Ivanovych Churyumov and Svetlana Ivanovna Gerasimenko who had detected it in September 1969. The object is number 67 on the list of numbered comets with “P” standing for periodic. How are planets and moons named? Who is Miranda? 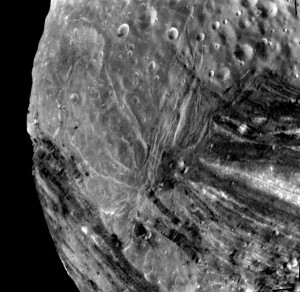 She is the heroine in Shakespeare’s last play “The Tempest”, but Miranda is also the name of a moon of planet Uranus belonging to a set of exceptions. Whereas all of the planets in our solar system and most of the moons are named after Greek and Roman mythology the satellites of Uranus have names that were used by William Shakespeare or Alexander Pope. Dwarf planets also are named after gods, but the Greek and Romans don’t govern the sky alone any more. Haumea discovered 2003 is the Hawaiian goddess of fertility and Makemake found 2005 is a Polynesian creator god. At the beginning there is a cloud of dusk and gas, as theory goes. The cloud collapses to form a star in the centre surrounded by a rotating disk. (Think of a spinning clump of dough flattening into the shape of a pizza.) Eventually small bits of the material in the disk begin to stick together somewhat like dust bunnies are formed. If they get larger they attract more material thanks to gravity. 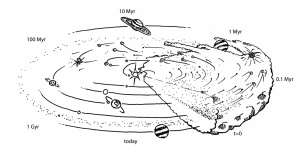 Planetesimals are formed that grow into planet embryos by collisions. 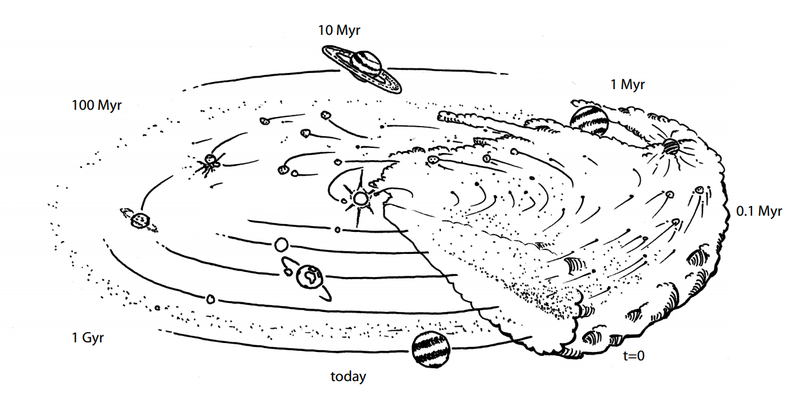 How the embryos turn into big gas giants like Jupiter or small rocky planets like Earth is still discussed. 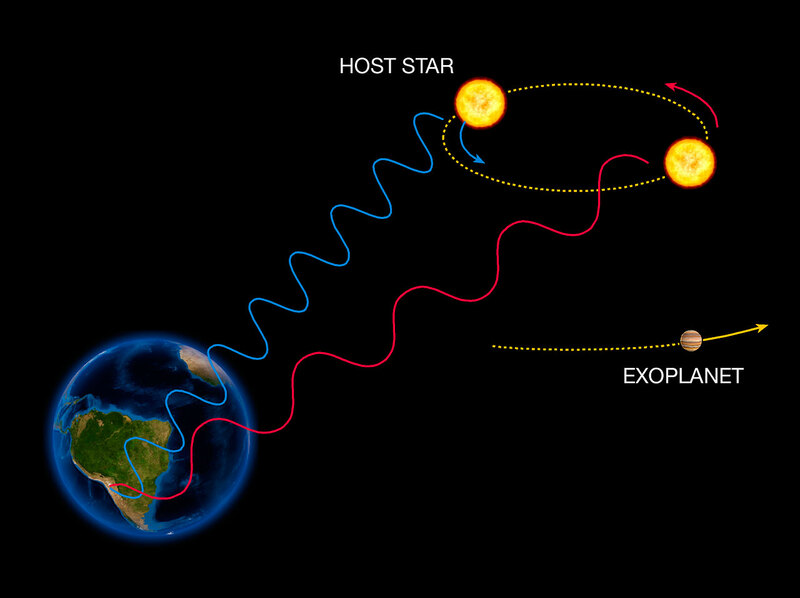 Since the discovery of the big exoplanets that are very near to their host stars most astronomers think that the planets probably migrate through their planetary system during formation. With computer models they try to simulate the process. How many dwarf planets do we know in our solar system? 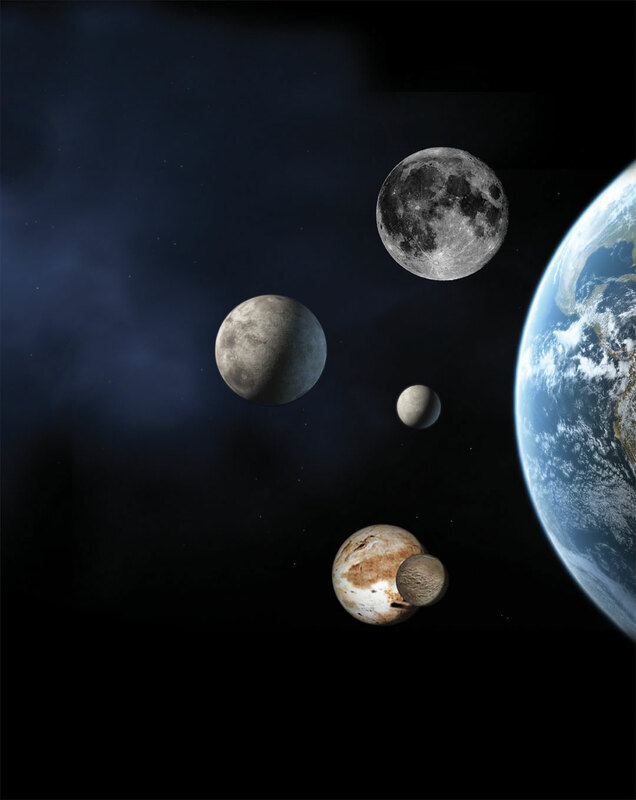 At the moment, only five celestial bodies were defined as dwarf planets by the International Astronomical Union (IAU): Pluto, Makemake, Haumea and Eris in the Kuiper Belt (beyond Neptune) and Ceres, in the asteroids belt between Mars and Jupiter. 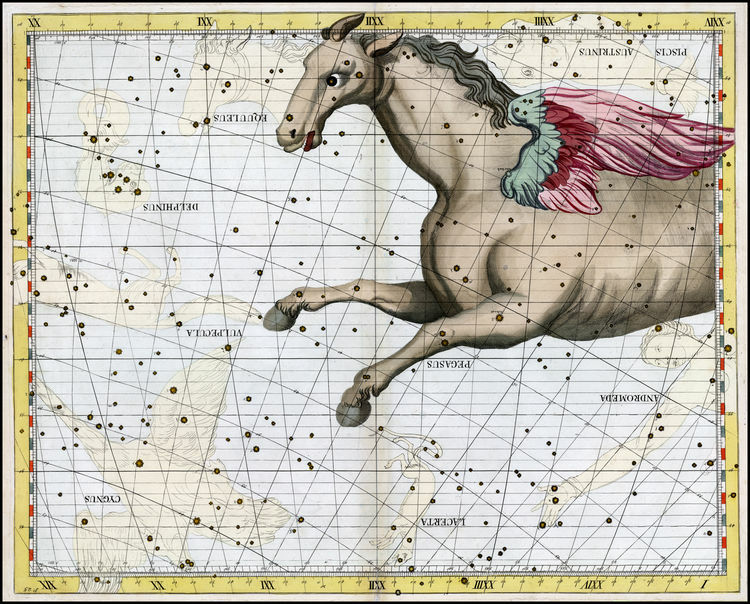 Candidates are Sedna, Orcus, Quaoar and Varuna, all trans-Neptunian objects. Pluto has long been considered the 9th planet and the farthest away from the sun. But since the discovery of another body with a comparable size to Pluto beyond the orbit of Neptune, the classification of Pluto was reconsidered by the International Astronomical Union (IAU). Pluto is spherical and revolving around the sun, however it is not alone in the area and forms part of the Kuiper Belt where other dwarf planets like Haumea and Makemake have been discovered recently. Be in a region where it is alone. In our solar system there are eight planets: Mercury, Venus, Earth, Mars, Jupiter, Saturn, Uranus and Neptun. 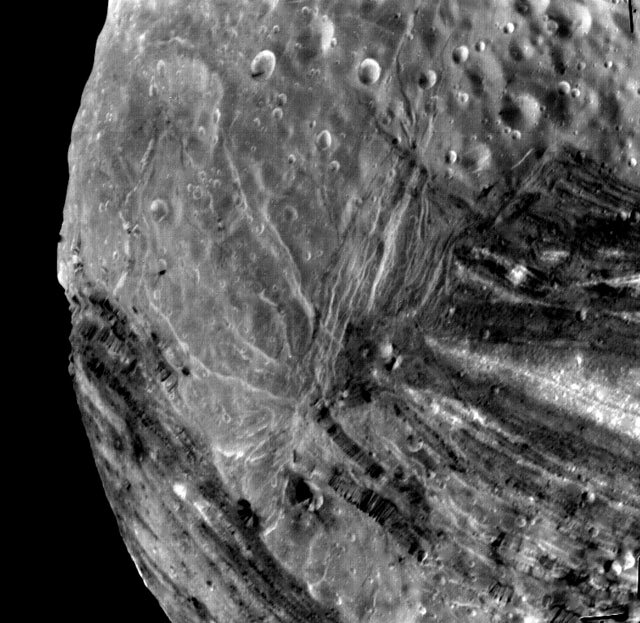 It is believed that comets and asteroids are the relics of the material that formed the solar system. They would not have evolved and could inform us about the chemical composition, the size, and the formation process of the protosolar nebula. It was long thought that the water found on Earth came from comets, but according to the latest results from Rosetta (ESA’s probe on the Churyumov-Gerasimenko comet) and Dawn (NASA’s probe on the Vesta and Ceres asteroids), it seems more likely that it comes from asteroids. 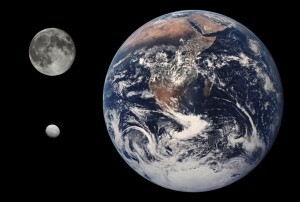 Earth, Moon and Ceres. Credit NASA.